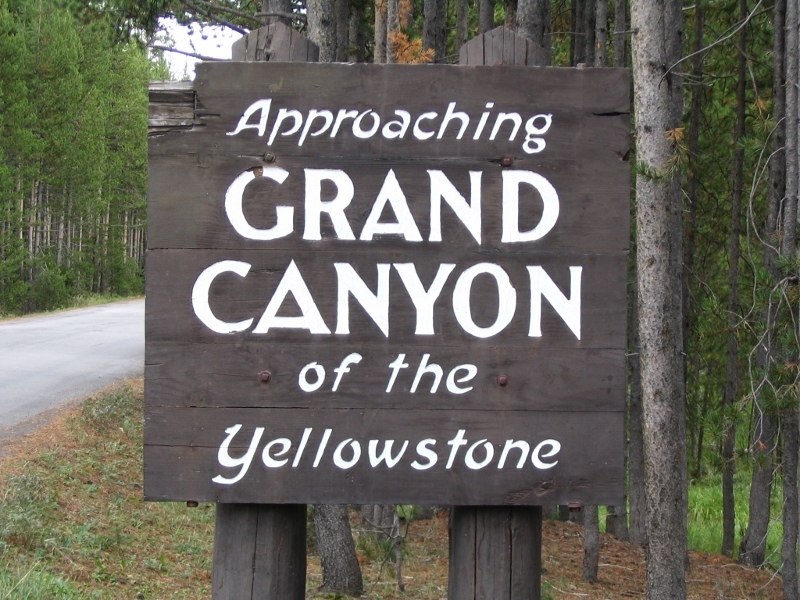 More than 35 years ago, as young adults, Alan and I had honeymooned by tent camping across the United States visiting seven of the grand and glorious National Parks and Monuments in the west. In 2007, we re-created that very same trip with our kids who were ages 13 and 8 at the time. 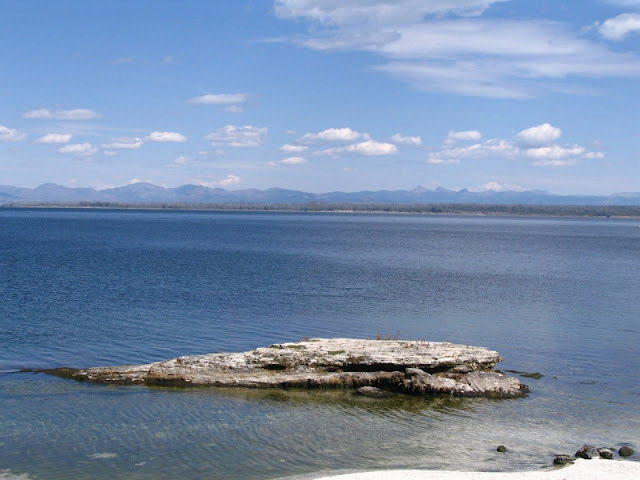 It would prove to be the first of three National Parks camping trips (so far!) we would take following the purchase of our first travel trailer in 2006. While I do love ALL of our National Parks, the visit to Yellowstone proved to be the highlight of that first cross country trip. Why? The most obvious answer is because of the geothermal activity in the Park courtesy of the numerous geysers, hot springs, mud pots and fumaroles. Beyond that major factor, I believe it’s because of the sheer variety of natural features that can be found in that one National Park. The mountains, hills and prairies of Yellowstone contain 278 named streams and 150 named lakes - including Yellowstone Lake, the largest high elevation lake (over 7,000’) in North America. 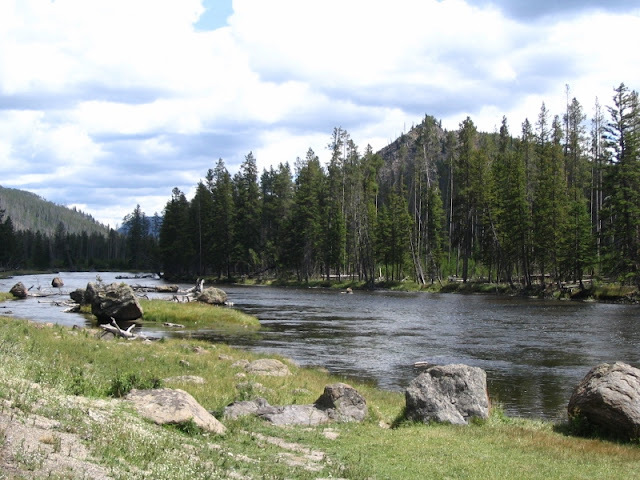 The headwaters of seven major rivers can be found in the Greater Yellowstone Ecosystem and the Park itself is home to the largest concentration of mammals in the contiguous 48 states with 67 species calling Yellowstone home. Three hundred species of birds have been sighted in the Park since record-keeping was established in 1872 and about 150 species actually nest here. In addition, camping, biking, hiking, fishing, boating and horseback riding may all be enjoyed in Yellowstone. The photo opportunities are spectacular and nearly endless considering the many different features of the Park. We spent quite a bit of time visiting the Park’s geothermal features, and the geysers were (not surprisingly) big hits with the kids. The fact that we were all able to share the excitement of Old Faithful with our friends Bob and Audrey who lived in Montana just north of the Park, made our Yellowstone adventure all that much sweeter and more memorable. We were thrilled to have the opportunity to see the wolves of Yellowstone in the Lamar Valley and we chuckled at the elk grazing by the Park offices near Mammoth Hot Springs. Without a doubt, we were awed by the grandeur of iconic Yellowstone Falls. Although we spent five days in the Park, we could easily have spent two weeks there without lacking for things to see and do. 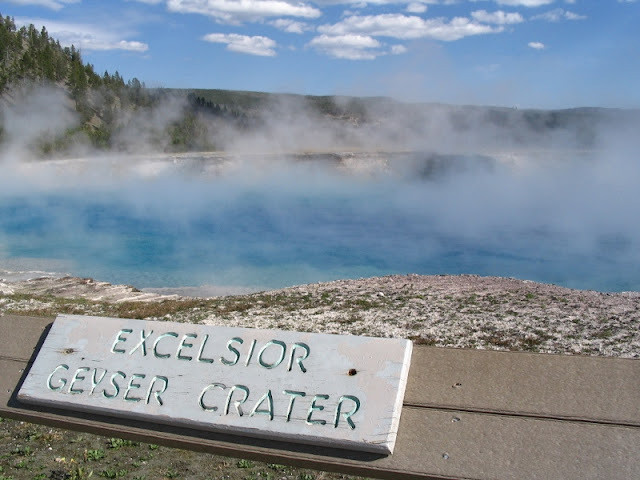 Despite having visited Yellowstone National Park twice now, I’d go back in a heartbeat – and I believe our kids would, too. 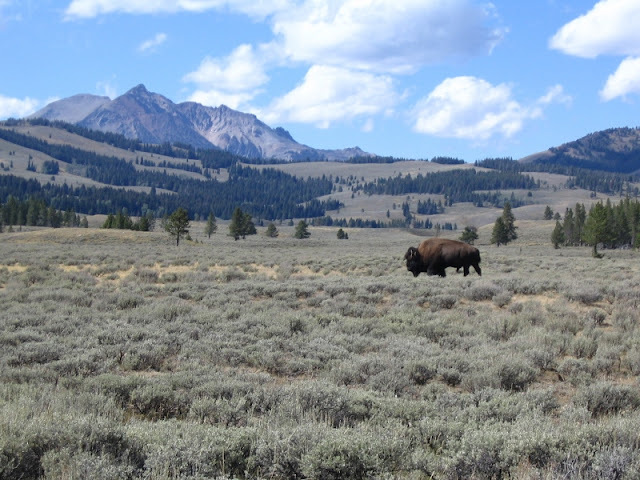 We saw only a few bison in the Park - but they were very impressive! Before concluding our visit to Yellowstone, Alan and I dragged our son and daughter along with us on an unusual scavenger hunt. More about that in a future post. Thank you for stopping by today! Please do come back to visit again soon! I could write about Yellowstone National Park for a week and not cover everything wonderful about this place. It’s definitely a Bucket List item. 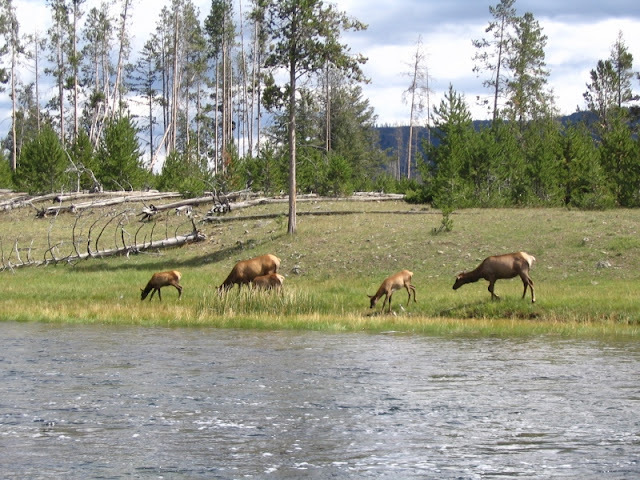 If you need some help in planning your Yellowstone adventure, be sure to visit the National Park Service’s web site (link HERE). We did Yellowstone last summer; your post brought back good memories. Now that I've found your blog, I've got to go back and read everything. Yellowstone was certainly memorable. 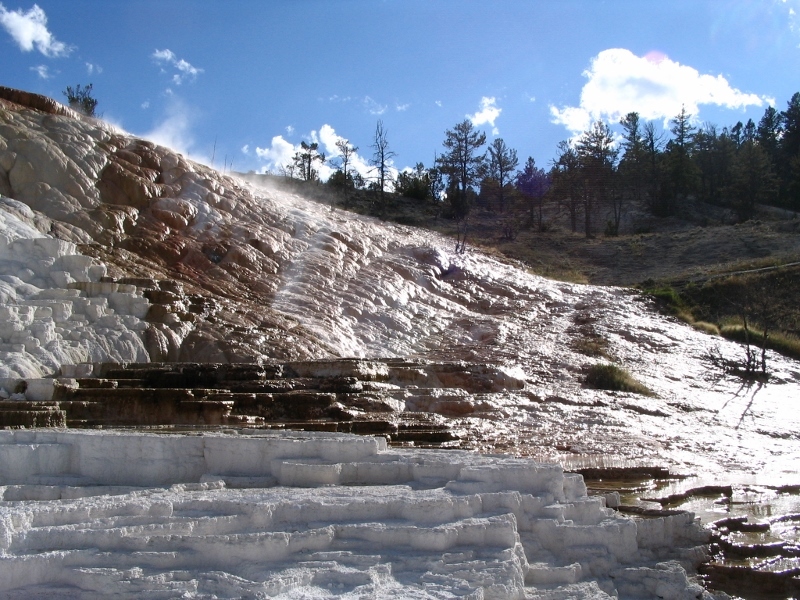 Now that I think about it, so was the size of the ice cream cones at the Old Faithful Lodge!